The swashbuckling spinoff coming to Blu-ray 3D in February has now been fully detailed! 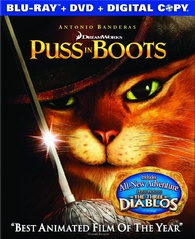 As previously reported, DreamWorks is preparing 'Puss in Boots' and 'Puss in Boots - 3D' for a a release on February 24. 'Puss in Boots' continues the legacy of Shrek,' the #1 animated franchise of all time, with the uproarious and irresitable origin story of the notorious fighter, lover and outlaw Puss in Boots. Filled with hilarious action and adventure, the true tail—er, tale—of how Puss became a hero long before he met Shrek delighted audiences of all ages with its non-stop laughs, daring deeds and original story. Boasting an all-star cast of voice talent including Antonio Banderas, Salma Hayek, Zach Galifianakis, Billy Bob Thornton and Amy Sedaris, 'Puss in Boots' is a must-own family film with serious cat-itude! The Blu-rays will feature 1080p video, a DTS-HD Master Audio 7.1 soundtrack, and supplements include: Purr-fect Pairings: The Voices Behind The Legends featurette, deleted scenes, Three Diablos animated short, and The Cat's Meow (six-part interactive feature). Suggested list price for the Blu-ray is $40.99 and $49.99 for the Blu-ray 3D. You can find the latest specs for 'Puss in Boots' linked from our Blu-ray Release Schedule, where it's indexed under February 24.